Our first night in San Francisco (that we didn’t pass out at 8 pm from jet lag), we had no problem deciding on sushi for dinner. 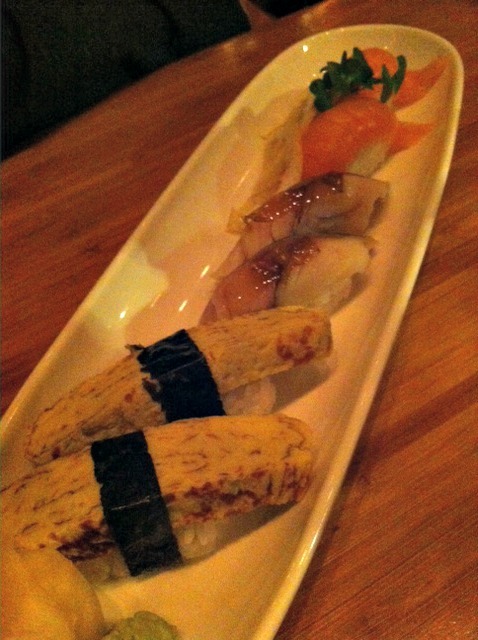 If you’re a sushi lover from the East Coast, you should know that the sushi on the West Coast is usually much better. We took a cab to Tataki, based on a Twitter friend’s recommendation. 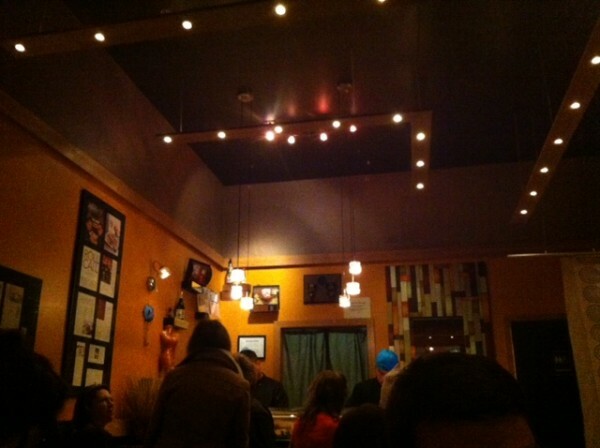 The restaurant was small, dimly lit, and no frills. Even though there aren’t photos of the restaurant on their website, I had the impression that the restaurant would be a little more chic, so Brad and I were both surprised when we found ourselves a bit overdressed at this very small casual sushi restaurant. We immediately ordered drinks when we arrived. 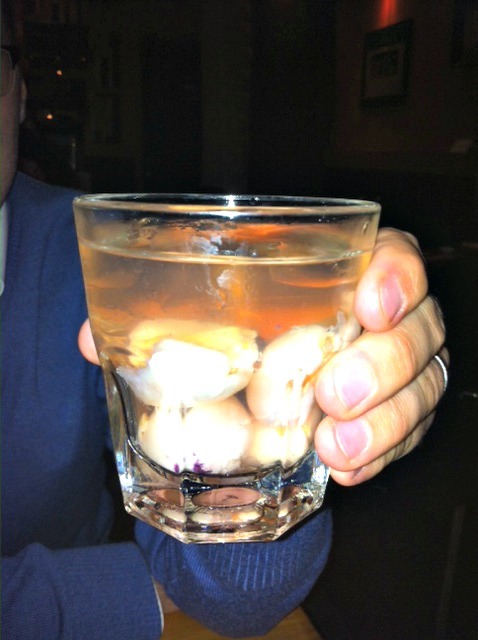 I went for the Pinot Noir, my drink of choice lately, and Brad ordered the Kin-san-gria, a housemade sangria made with sake, riesling, and what appeared to be lychee fruit. I have to point out that this was the saddest little glass of wine. 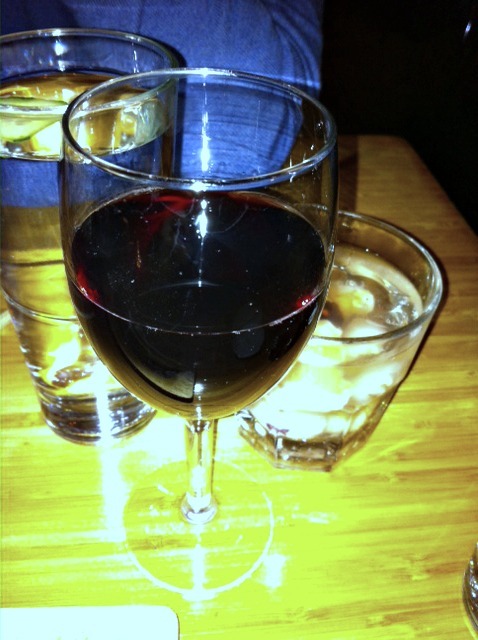 I enjoyed the wine, but the pour was extremely small. You can’t really tell from the photo, but the glass was very small, like one you might use at a wine tasting. The pour was definitely less than 4 oz. which didn’t really match the $10 price tag. Brad said his drink was interesting. I don’t think he would order it again, but he’s not much of a fruit drink fan anyway. One thing that is important to know about Tataki is that they’re committed to only serving fish that are raised in sustainable aquatic environments, so no farm raised salmon and other fish on deemed harmful to the aquatic environment. This means you won’t see all of the variety of fish you would typically see on traditional sushi menus and you’ll see some fish that you probably have never heard of. 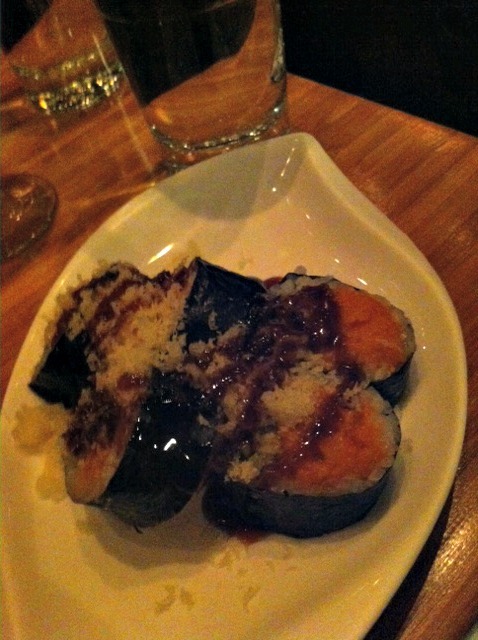 We started with a spicy tuna roll, which was Brad’s favorite of the night. It was a little spicier than the spicy tuna rolls that we’ve had in the past and we both really loved that. 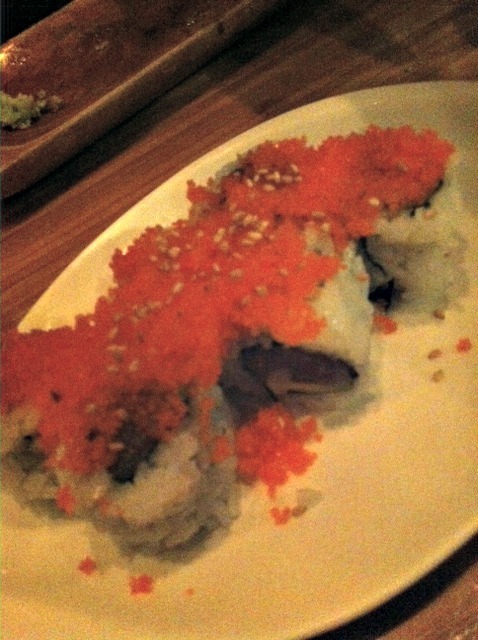 We also ordered some nigiri: masago (egg) for Brad, mackerel, and something the waiter said was like salmon. I agree, the taste was very similar to salmon. After those two rolls, Brad and I were still starving, so we ordered two more. First up was a simple California roll. This is something we rarely order at a sushi restaurant, but Tataki’s menu is very small and seems to center around albacore tuna and shrimp. 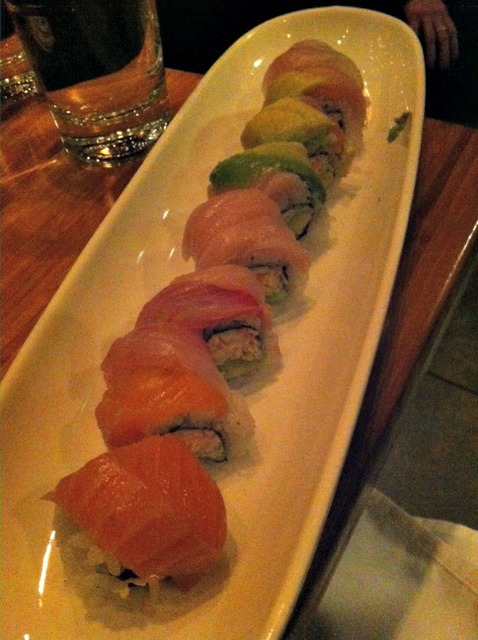 Last, we enjoyed the rainbow roll, which is basically a California roll, with five different types of fish and avocado. This was my favorite dish of the evening. The fish was very fresh and I always love the addition of avocado. Brad and I enjoyed Tataki, even though it wasn’t exactly what we were expecting. 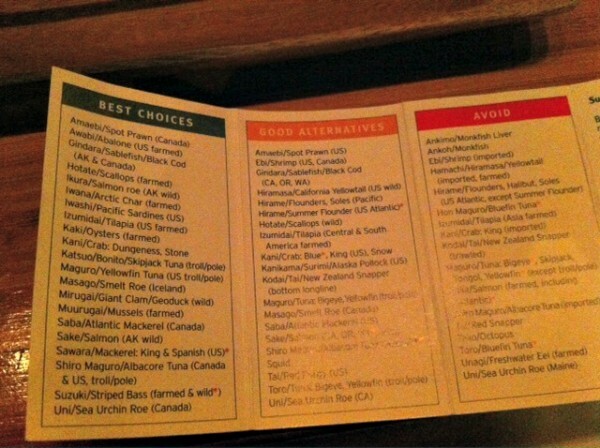 I am a little curious why they didn’t include wild Alaskan salmon on their menu, which is listed as one of the “Best Choices” on a sustainable seafood card that was on the table. I also really missed eel. Eel is my favorite fish when eating sushi, but is also one of the most endangered aquatic animals. But I understand why they didn’t include eel on their menu. The whole philosophy is that we have to be careful what we eat now so sushi can be enjoyed in future generations, and I think that’s a noble effort. After dinner, we caught a cab to the Mark Hotel which has a swanky bar/lounge on the top floor called Top of the Mark. We found this place when we visited San Francisco about three years ago and loved the panoramic view of the city and knew we had to come back. 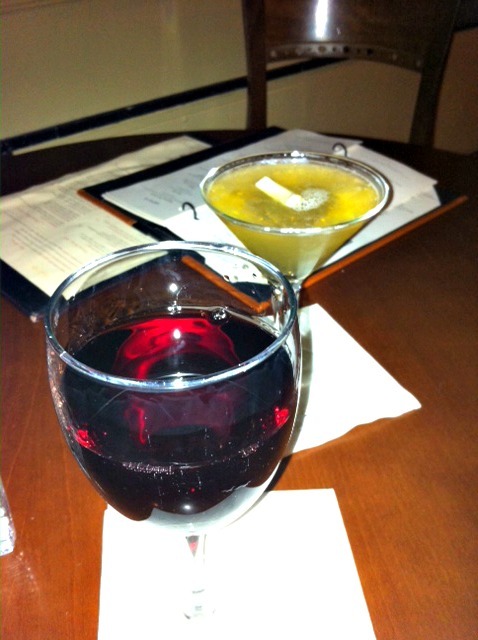 I ordered (a healthy) glass of Pinot Noir and Brad ordered from their extensive cocktail list, choosing what other than a drink made with Maker’s Mark (his favorite). We sat near a window and enjoyed the view why the band played jazz and big band music. 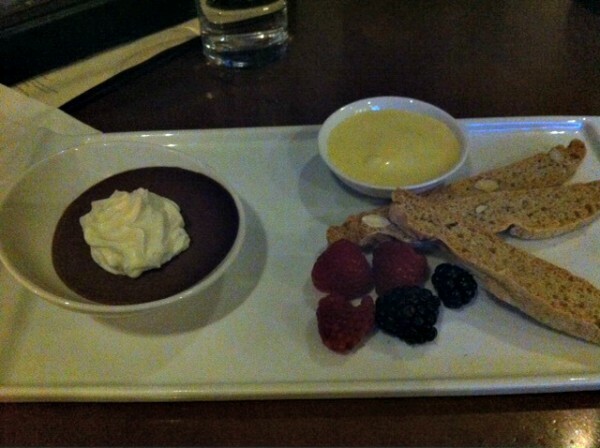 Before leaving, we ordered dessert — the chocolate pot de creme. This was a simple dessert that was a little underwhelming. The Kahlua infused custard tasted a little too much like chocolate Jello pudding. When I order something called chocolate pot de creme, I just expect something a little more decadent, which this wasn’t. However the view, the libations, and the company more than made up this lackluster dessert. 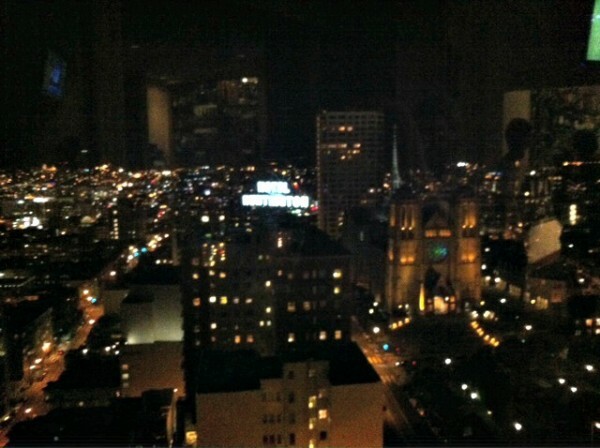 I highly recommend checking out Top of the Mark to anyone visiting San Francisco. At least in my very limited experience, people in San Francisco dress very casually. I was overdressed in a casual dress, tights, and boots at the sushi restaurant. Everyone else had jeans and sweaters on (It’s really not that cold here, but it seems like the locals pull out their heavy winter clothes when the weather dips into the 50’s). 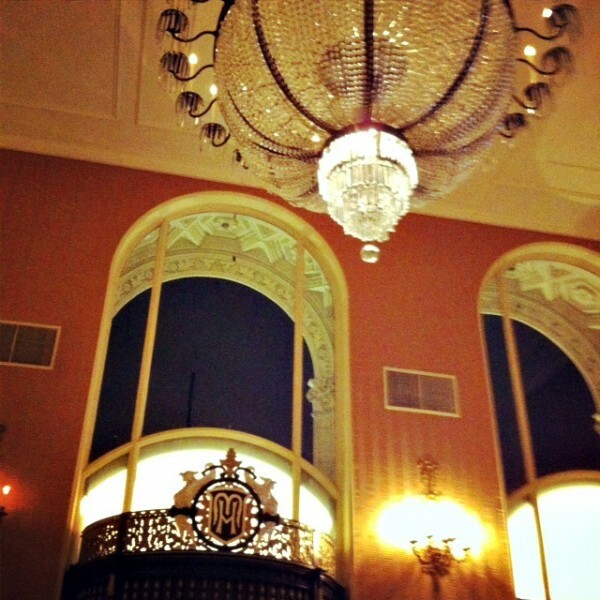 Even at Top of the Mark, which is a very upscale place, Brad and I were probably the dressiest people there. He had on a sweater, pants, and a button-up shirt. So when visiting San Francisco, don’t worry about packing formal clothes and instead pack jeans and leggings for the colder months. Brad’s drink at Top of the Mark would have been better if it didn’t have the crushed cigarette in it…probably. 🙂 Hope you’re have a great time! Haha! I thought it looked like a pat of butter.